Video Series: Eat Yourself Gorgeous Meal Makeovers! Here are two of my favorite foods to help protect you against the flu, curb unhealthy cravings, boost energy levels, and get that skin glowing. Not to mention a way to make your favorite comfort foods a bit healthier. Pasta please! Instead of your traditional pasta, go for skin clearing spaghetti squash. This sassy squash is packed with vitamin C, vitamin A, potassium, fiber, and magnesium. Need some energy? Hello magnesium! This mineral is responsible for energy production within the body. It also helps slow down the aging process which will minimize those pesky crows feet and fine lines. Feeling a bit bloated? Potassium helps flush the body of excessive toxins and waste that is fantastic for de-bloating. Vitamin C and vitamin A protect your skin from dry, flaky, rough patches and is key in strengthening your immune system (two of the best vitamins for fighting the flu around.) Squash is a healthy carbohydrate high in dietary fiber, which will keep you more full for a longer amount of time. This will help prevent you from reaching for that office donut. The rich warm flavor of squash is a flu fighting favorite of mine; it will warm you without filling you out. Not to mention, tastes divine! Check out my simple video tutorial on how to make it here. Precious pumpkin! 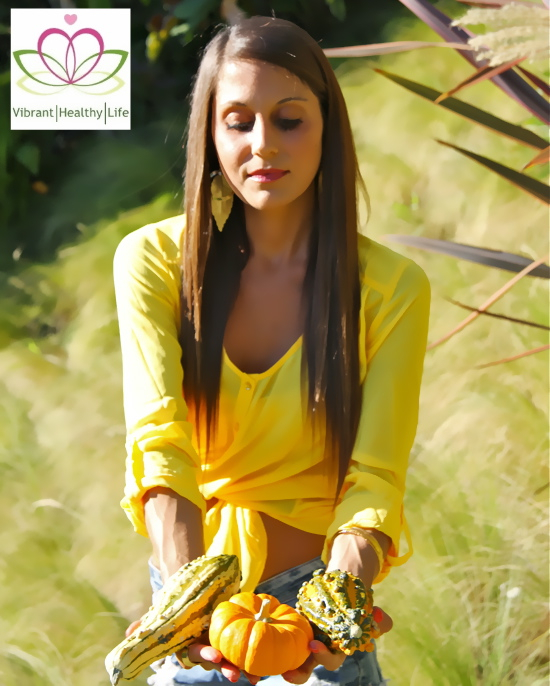 Pumpkin is one of my favorite skin super foods loaded with vitamin C, vitamin A, fiber, potassium, and magnesium. Not to mention, beta-carotene, a cancer fighting antioxidant. Vitamin A is fantastic for the bags and dark circles under your eyes, while vitamin C will give your skin a young, dewy glow. These two vitamins are also great immune system boosters. Here is my pumpkin pancake taco recipethat is a client favorite and takes less than 10 minutes to make. Stay tuned for all new Eat Yourself Gorgeous Meal Makeover episodes out soon (watch episodes 1-5 here) and a very exciting announcement I am waiting to share with the community! For more free videos, health tools and easy recipes join the VHL party and connect with me!